Few industries are so bound by the trappings of family heritage, pride and larger-than-life characters as the world of big branded luxury. For Axel Dumas, the 47-year-old CEO of $40bn (€34bn) fashion giant Hermès International, family responsibility runs deep. 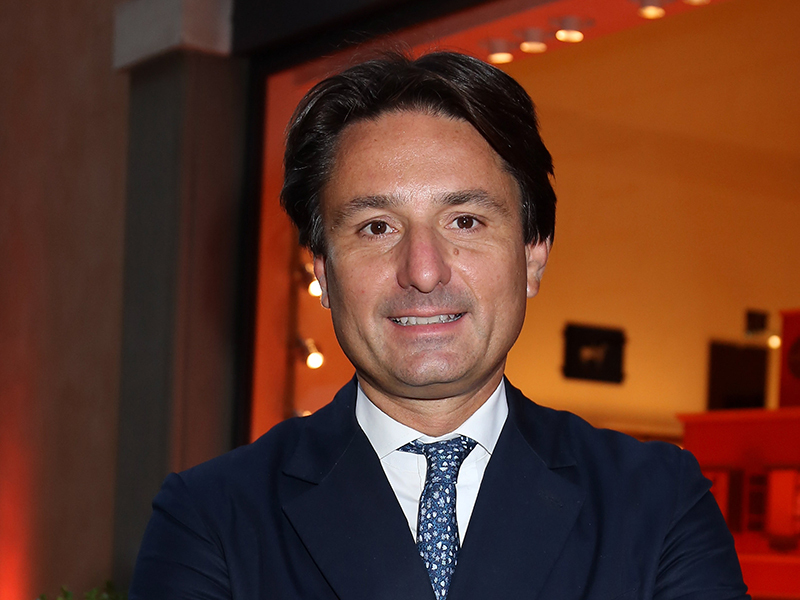 He is a sixth-generation member of the family that founded the Hermès brand, and his family retains control over the company to this day, collectively owning approximately 70 percent in share capital and forming a large part of the executive board. Growing up, Dumas’ mother held the role of managing director, while his uncle, Jean-Louis, was CEO. His grandmother is said to have instructed him to protect the company while on her deathbed. It is inevitable, therefore, the family-centric nature of the business dealings at Hermès have shaped Dumas’ role. Dumas’ leadership has been defined, more than anything else, by his role in the infamous rift between his own family and the extravagantly wealthy Arnault family, which owns a majority stake in the $130bn (€110.3bn) Moët Hennessy Louis Vuitton (LVMH) luxury conglomerate. The intertwined business dealings of the families only recently came to a close in April, when LVMH relinquished its final share in the Hermès enterprise. The move marked the end of seven years of fraught business dealings between the two families. Talking to European CEO, Mark Tungate, author of Fashion Brands: Branding Style from Armani to Zara, noted Dumas fought off the LVMH takeover attempt with “both conviction and panache”. Dumas himself described the saga as the “battle of our generation”, when speaking to the Financial Times in a rare interview. LVMH staunchly denied its secret share accumulation was a takeover attempt, but the move would represent the first weave in a web of legal battles and formal investigations. The battle waged on for years, and was in full swing when Dumas took the role of co-CEO in June 2013 – a position he shared with Thomas for a short period before taking full control. Indeed, just two weeks into Dumas’ tenure, Hermès filed a landmark lawsuit against LVMH seeking the cancellation of the equity swaps it had used to secretly build up shares. Ultimately, the Dumas family grouped together to guard company independence. Recounting the event to the Financial Times, Dumas said: “What was admirable is that the family really gathered herself to keep the independence of Hermès. We created a holding company called H51, which owns 51 percent of the company, where no one is allowed to sell their shares for 20 years. The bad blood between the two families ended, for the most part, in 2014, when an intervention by a French court prompted LVMH to redistribute the disputed 23 percent stake to shareholders and institutional investors. It wasn’t until LVMH faced complications in its acquisition of Dior Couture, however, that the Arnault family finally relinquished its remaining financial foothold in the company – bringing the debacle to a resounding end. But this intense family rift is not the only difficulty that Dumas has faced; leading a global luxury brand in the 21st century is a paradox-laden job. In the present climate, luxury companies are fighting to maintain the allure of scarcity while pushing for ever-increasing production. 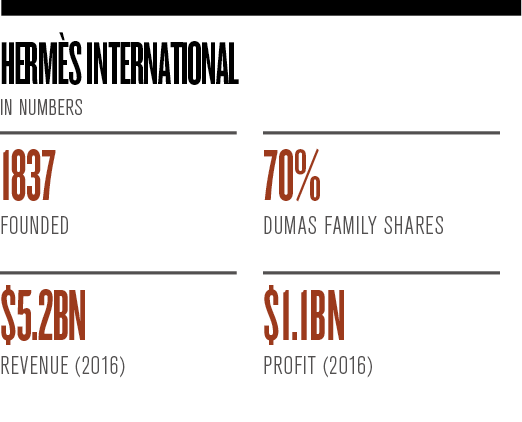 In financial terms, Dumas has presided over an impressive upwards streak in both profits and revenue. In 2013, the group’s revenue stood at $3.75bn (€3.2bn). This grew to $4.1bn (€3.5bn) in 2014, $4.8bn (€4.1bn) in 2015 and $5.2bn (€4.4bn) in 2016. Profits, meanwhile, started at $780.4m (€662.4m) in 2013, and grew to $859m (€729.1m) in 2014, $972m (€825m) in 2015 and $1.1bn (€933.7m) in 2016. What’s more, the operating margin recently reached an all-time high, hitting a rate of 34.3 percent of sales during the first half of 2017. During a time of mass expansion, Hermès has done a remarkable job of maintaining the draw of its brand. As Tungate said, Hermès has “managed to have its cake and eat it too”. Put a little more coarsely by Dumas himself, the company has sought to “grow bigger but not fatter”. The reason behind this success could be the company’s infamous ‘waiting list’, which ensures customers who order a Hermès handbag frequently have to wait upwards of two years before they receive it. And yet, despite clever tactics like the waiting list, the implications of global expansion are presenting a stubborn challenge to the sector. Giana Eckhardt, Professor of Marketing at Royal Holloway, University of London, said: “As luxury companies become globalised, it is becoming harder to demonstrate authenticity, heritage and craftsmanship, three of the main drivers of luxury consumption. Faced with a range of fundamental challenges to the sector, it is notable that there is more to Axel Dumas than a mere hard-edged businessman. Tungate argues Dumas exhibits a particular mix of “toughness and romanticism”, which is a good combination for a CEO in the luxury industry. This romanticism was laid bare when Dumas said he would, given the choice, spend his time philosophising. “From time to time, I fantasise that I’m going to go back to my philosophy study,” Dumas told the Financial Times, when asked what he does in his spare time. However, Dumas isn’t the only Hermès heavyweight to view the world with a philosophical slant: his cousin and Hermès’ highly regarded creative director, Pierre-Alexis Dumas, is also well known for his ruminations on the topic of luxury. Indeed, he was described by the few who have interviewed him as holding the “manner of a philosophy don”, and being “more like a scholar of Eastern philosophy than a creative director”. This philosophical thread is no coincidence. In fact, Eckhardt aptly described why it makes good business sense: “Consumers want to buy a type of magic when they buy luxury products. This desire to seek out the best of mankind’s efforts from an aesthetic standpoint is something that a philosophical background allows you to understand and to tap into. Indeed, philosophy is one hobby that will stand Dumas in good stead when tackling the particularities and peculiarities of the luxury brand industry, especially as it faces the fundamental shifts ahead.